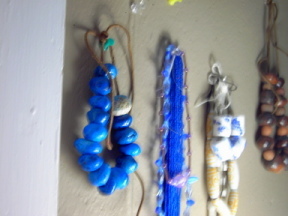 I love beads. I have a bunch of semi-precious gem beads that i got over a year ago that are just sitting in the closet waiting to be turned into something magical. It's about time to pull those babies out and put them to good use. When I figure out how to revive my digital camera, I'll post pics of my stash. I have been so focused on the business aspect of art and design lately, that I have forgotten to make stuff just for fun! This makes me a very crabby girl! I am going to make a luscious gem necklace for myself this week. Man, I gotta figure out the camera situation if I want to really get into this blog thing!